A regional daily has restored the definite article to its name and masthead after a 46-year break. Yorkshire’s daily newspaper has once again become The Yorkshire Post, having dropped the ‘The’ in 1968. The change is part of a major refresh of the Johnston Press-owned title under new editor Jeremy Clifford, who took over in September. Jeremy said he aimed to broaden the paper’s appeal while maintaining its authority and reputation for in-depth news coverage. Other changes to the 260-year-old title will include a comprehensive new Saturday sports section with more pages covering regional and national sports. Saturday’s edition will also feature a new personal finance section page while the Saturday Country Week section is being extended. A new Country and Farming page on Wednesday will offer further coverage of rural affairs and there is a new page dedicated to nostalgia. The relaunch is being supported by a six-figure poster ad campaign and an accompanying campaign on social media. Said Jeremy: “Our news coverage is changing. It will continue to reflect what our existing readers want, but it will seek out new, fresh and entertaining news from across the region. “Reintroducing ‘The’ cements our position of being THE best place for news, sport, entertainment, culture, analysis, debate and campaigning. Those three letters set the standard by which we will continue to be THE national newspaper for Yorkshire,” added Jeremy. THE will set the standard and broaden the paper’s appeal to those who like a definite article. THE will also help maintain its authority and reputation. More importantly it’s bound to increase circulation. Just sums up the thinking in JP ivory towers. All’s well with the world now the definite article has been restored. A six-figure ad campaign? Seriously? I’ll pass that info on to my colleagues who are being made redundant at the end of the month. They’ll be delighted. I thougt we were all supposed to be One Johnston Press Team now Ash? Let joy be unconfined…… Feel better now. They should have alerted us first though. I heard of the change to THE Yorkshire Post and thought it an idiotic move. Why create work for yourself? All those house ads and websites that now need re-branding. But that’s when I thought it was just a case of adding THE. But oh no, look at it! On its side, on a yellow box. Is this what the designers left at JP, or in India, or wherever they are these days, call good design. Reduce that down to appear in a house ad and you’ll just see a small yellow ‘thing’ next to the masthead. What is the mono option like, or reversed out? 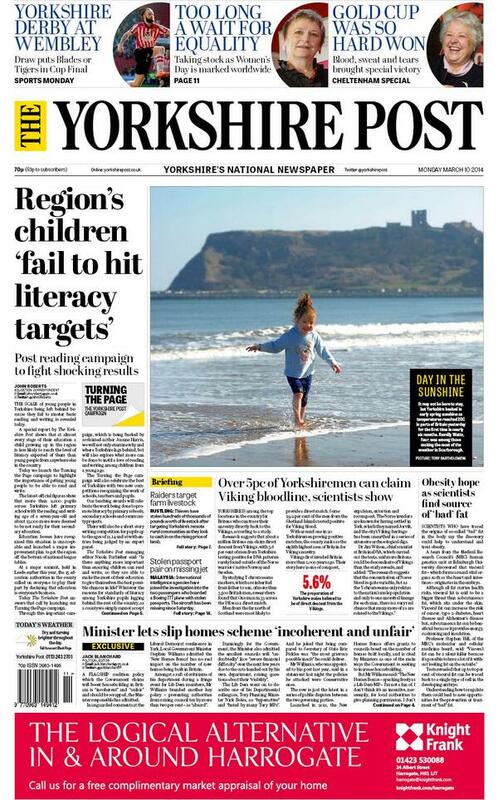 And it’s so awkward to say … your new look THE yorkshire Post. The THE doesn’t cement anything, just looks awkward. Can’t comment on the inside. Haven’t wasted any money purchasing it. Never mind the ‘definite article’, what about the horrendous front page layout? Apart from the ‘the’ it doesn’t look any different. And perhaps instead of claiming to be ‘the’ only paper covering such big stories they will now stop lifting them from other local papers. There’s an ad campaign? Can’t wait to see it. Shouldn’t it have been running prior to launch, counting down. Never saw or heard a thing via a campaign. I heard from someone who had seen it in the THE Yorkshire Post, who thought it looked shocking. But advertising within a product that is already being purchased won’t gain the new readers Jeremy Clifford refers to. Six figure sum to add ‘the’ to the title? Meanwhile, where are my journalistic and photographic colleagues? Oh yes, made redundant. No doubt sales of THE Yorkshire Post will rocket now. Does the byline of the lead story refer the THE Yorkshire Post as Post? Surely it’s always been “T’Post” in Yorkshire? That photograph on the front page must be one of the biggest cliches in regional journalism. There are MILLIONS of photographs of the North Bay beach, Scarborough, with the castle in the background. If the Yorkshire Post is to survive it must be much more original and stop thinking that its readers will accept any old rubbish. The Lancashire edition used to carry at least one story every day from Scarborough, usually some fish and chippy court case or a council story. I buy a copy of the paper in Preston when I can and lately there’s been nothing in at all from the “Queen of the East Coast”. I think one problem the paper has is that too many of its journalists are merely using the Yorkshire Post as a stepping stone to a job in London. The Business News is too full of press releases from accountants, solicitors etc. They should take a tip from the Daily Mail’s Money Mail on Wednesday. Ahh, there he/she is again in all his/her glory. JP cost cut victim doing what he does best – living up to his/her name. you wont be surprised to find that the front page pic is from a freelancer. It is easy to sit in your armchair and criticise, but it is vital that editors keep their publications looking fresh to ensure they are competitive and I for one think those at the YP have done a great job. Branding is hugely important when it comes to ensuring the success of any business. And a lot more has been done regarding the design than just adding THE. Maybe you should try buying a copy and having a look – some support for one of Britain’s leading regional newspapers would not go amiss, rather than just running it down. Times are tough for all newspapers. I’ve experienced the frustration and sheer stress of working in an understaffed newsroom. But if people do not get rid of the negative attitude that seems to pervade a lot of newsrooms these days then there really is no hope for the industry. I quite like it. At least they’re trying to do something positive rather than just moan that the industry’s going down the pan. I’m an ex journo too and wish Jeremy luck. Nice to see a bit of fun being had. Bob the bulk sale builder … got anything to say on the subject? I agree that keeping the title looking fresh is necessary, but I do not like the THE, as it has been designed, at all. This now makes the masthead the full width of the broadsheet page. It’s too large. I find the use of the circles a little lame, and I imagine the blurb rules will soon be broken when images don’t fit into these circles. The most important change sounds like it is in the content, which as I said I have not read. But to attract the new readers, they must judge by the cover initially… and the ad campaign. If they like what they see and read and it is good value, you have your new readers. I agree with OlYellowbird. It is at least a positive thing which is rare these days and branding and marketing play their part in selling newspapers like good editorial and adverts. Still nothing to add to your lame comment, Bob? Let’s cut to the chase. If the YP has indeed spent a six figure sum on this campaign, it is a waste of money. The masthead is not a success, but most – though not all – of the design and typographical changes are an improvement. I suspect the worst elements have been imposed from outside. I live in Yorkshire and the poster campaign is an embarrassment. Why is the YP spending so much money on this when its editorial standards are going down the plughole? It has been one of the strongest newspaper brands in the country. Sadly, its heritage, position and potential are being destroyed by people who don’t know what they’re doing. Invest in content and journalism – everything else follows on from that, including the digital future. Beenthere … couldn’t agree more. I haven’t come across a poster, but if it is simply an enlarged version of the in-paper ad, I think it is poor. Regarding THE masthead, that has to outlast any page/content re-design. What night be fashionable in design terms this year and next will not be in ten years. Good design is as much about what you leave out, as what you put in. Photographs do not need a border, especially when there is a dividing line between stories. A page can look cluttered very easily, when the aim is to achieve a fresh, modern look. The front page has very little white space, but what there was, around the masthead, has now been taken up by THE. This comment OK with you Bob?